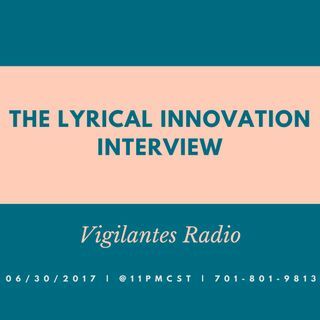 Esplicito The Lyrical Innovation Interview. Marketing, Promotional & an Social Media Influencer company, Lyrical Innovation, stops by to chat with Dini about start-up business, the positives and negatives of the music industry & their impact on the independent music scene. To find out, set your reminders, it's happening! 06/30/2017 | @11PMCST | ... Maggiori informazioni Call in at 701-801-9813 | You can also hop in the mix by visiting www.onlyonemediagroup.com/vigilantes-radio-blog and slapping that "Go Live" button | Please follow our show at www.spreaker.com/onlyonemediagroup & remember sharing is caring! Be sure to follow our show there! Thanks for your continuous support!